Bubbles, beats and brunch. The name says it all well and this cruise is ready to take your brunch to the next level. It’s brunch, but not as you know it. Sip on bubbly or get creative at the bloody mary bar as the beats keep you dancing the day away. When you need to escape the hustle and bustle, get your crew together, get down and make your Sunday count. See New York. Be New York and brunch it up on this party cruise! Head to Pier 15 in the South Street Seaport to check in for your party brunch cruise. Once boarded, you’ll be shown to your shared table. If you need anything or have any questions at any time, please be sure to let your waiter or one of the other friendly staff members know. 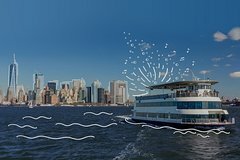 You’ll start cruising at 1:30pm to enjoy the sights of the East River, New York Harbor and Hudson River, all the while enjoying the bubbles, beats and brunch. Your admission includes shared brunch plates, bottomless mimosas and access to the bloody mary bar. Shared brunch plates include donuts, fried chicken, waffles, fruit, cheese and crudite, as well as a parfait bar. Additional a la carte items are available for purchase on board. While you cruise you'll get a great view of the Statue of Liberty, Ellis Island and, of course, the ever present Manhattan skyline with Freedom Tower. The cruise will also pass both the Brooklyn Bridge and Manhattan Bridge along with views of Brooklyn’s waterfront. Watch it all pass by again on the way back while enjoying drinks and dancing to the beats of the on-board DJ. The cruise returns back at Pier 15 at 2:45pm and ends while dockside at 3:00pm.